If you're lucky enough to see a "tall ship" in St. Mark's Basin, there's a good chance that it's the Amerigo Vespucci. 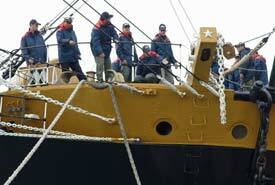 The three-masted sailing vessel entered service in 1931 as a training ship of the Italian Naval Academy. 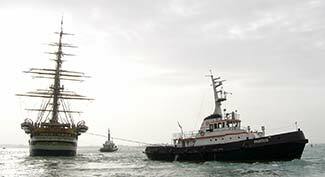 The ship is based in Livorno, Italy, and shows up in Venice from time to time as it cruises the Mediterranean or travels to sailing-ship regattas and other events around the world. It normally moors along the waterfront near the Giardini Pubblici and the Biennale grounds, and public tours are often available. ABOVE: The Americo Vespucci leaves the Venice waterfront on a cool, foggy autumn morning. 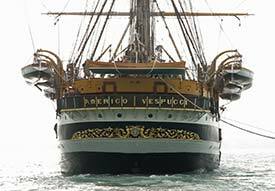 For more information about the ship, read the Amerigo Vespucci pages at Wikipedia, Schoonerman, and Netcowork. The crew casts off from the Amerigo Vespucci's berth on the Venice waterfront near the Biennale grounds.